Serving the greater Delaware Valley for more than 40 years. Your teeth are meant to last your entire life! Dr. Sophocles, along with our highly-trained staff, will outline the proper preventative measures you should be taking to protect your teeth. However, if restorative procedures are necessary, you can rely on our team to recommend and craft quality fillings, inlays/onlays, crowns, or implants and dentures, using porcelain and composite materials. Are you less than thrilled with the look of your smile? Over time, our teeth are subjected to wear and tear that can make our smiles look old and worn out. Our dentists have a proud tradition of practicing cosmetic and aesthetic dentistry, which specifically addresses the appearance of the teeth and gums. We will find the right combination of tooth whitening/bleaching, reshaping, dental bonding, porcelain veneers (laminates), porcelain crowns, and/or orthodontics to help you maintain a beautiful smile! Our office is conveniently located one mile off I-476, on the border between Media and Wallingford. For your convenience, we offer flexible office hours and a variety of payment options. 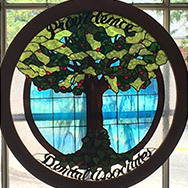 Ask our staff about the Providence Dental Savings Plan: Enjoy the benefits of no deductions, no maximums, and discounted procedures while making regular visits to our office. Download our flyer for more information. We now participate with United Concordia, if you are employed by Comcast, Chevron, or NBC Universal. New patient? We’ve prepared information on what to expect on your first visit. We look forward to seeing you! "Visiting Providence Dental Associates of Media gives my family and me more reasons to smile."